Home→Book Deals→2018 Holiday Gift Ideas: Books are The Thing! 2018 Holiday Gift Ideas: Books are The Thing! It’s that time of year again! The colder months are the perfect time to crack the spine of a new page-turner. After all, there’s no better present than a trip to another world! 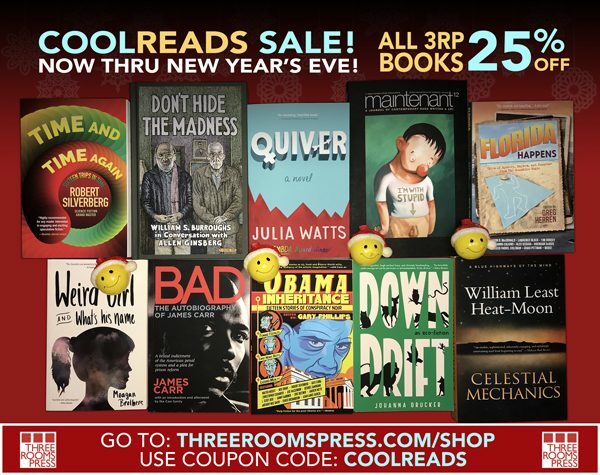 And, from now until December 31, 2018, ALL Three Rooms Press titles are 25% off! To save, go to the Three Rooms Press bookstore. Choose your favorite titles. View cart. Enter the coupon code COOLREADS and your discount will be applied. Hot off the THREE ROOMS PRESS! edited by Steven Taylor with original cover art by R. Crumb. 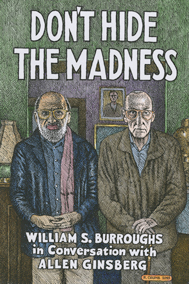 This never-before-published transcription of a four-day conversation between legendary literary icons William S. Burroughs and Allen Ginsberg is an essential for any bookshelf! DON’T HIDE THE MADNESS is a show-stopping gift for any fan of the beat movement or of counterculture, with new photos taken by Ginsberg himself, an introduction from long-time Ginsberg collaborator and editor Steven Taylor, and a beautiful original cover-piece from artist R. Crumb. Experience what Sensitive Skin Magazine calls a “fly-on-the-wall” experience while Ginsberg and Burroughs discuss everything from meditation to murder! The perfect book for your younger reader who’s not afraid of thorny issues: award-winning author Julia Watts tackles tough topics in her new novel, QUIVER. Libby and her new friend Zo have a lot in common—and a lot that makes them different. Libby’s evangelical Christian upbringing (the “quiverfull” lifestyle embraced by her family) makes for a tempestuous relationship with her new neighbor, Zo, a gender-fluid teen whose feminist, socialist, vegetarian family recently relocated from the city. Can their friendship survive despite these differences? Pick up a copy of QUIVER this holiday season for a heart-warming story of courage and compassion in the face of adversity. With short fiction good enough to drag you away from twitter, SONGS OF MY SELFIE delivers an unflinching look at the new-adult experience, featuring seventeen vibrant stories from millennial writers, each accompanied by—you guessed it—a selfie! From unemployment and debt to identity politics and family ties, these stories touch on tough issues with the classic millennial irony and the empathy of personal experience. A knockout read for all ages! Ready to fall in love with geeky, lovable characters and beautiful, smart writing? This LGBT YA novel revolves around the friendship between Lula and Rory, two self-described geeks obsessed with The X-Files who feel they’ll never fit in with anyone else. When suddenly Lula begins to discover that Rory is hiding things from her, their friendship is disrupted–and then she disappears into the middle of the night. While you’re following along with their relationship, first through Rory’s perspective and then through Lula’s, you’ll fall in love with the characters and wish they could come out of the book to join you for your next Netflix binge—especially if it’s the X-Files. The weather outside is frightful…but we’ve got just the thing to warm you up! FLORIDA HAPPENS is the perfect escapist pick for the frigid months ahead. Get wrapped up in thrilling stories by writers like John D. MacDonald, Tim Dorsey, and Susanna Calkins, and we promise—you won’t even notice the cold! This satirical best seller makes a superb gift! This set of high-octane stories elevates conspiracy theory to an art form, riffing off of the many outlandish theories passed through the political grapevine about the Obama family. THE OBAMA INHERITANCE: 15 Stories of Conspiracy Noir is edited by the king of pulp, Gary Phillips, and features contributors like Walter Mosley, Nisi Shawl, and Eric Beetner. The perfect gift for music-lovers with an appetite for suspense! This collection includes tales by music insiders Galadrielle Allman and singer/songwriter Willy Vlautin, as well as stories by noted authors Allison Gaylin, Val McDermid, and Craig Johnson. All edited by Wall Street Journal pop rock critic (and mystery writer!) Jim Fusilli. Better watch your step! Things get edgy in DARK CITY LIGHTS: New York Stories of Noir, all edited by the master of crime fiction Lawrence Block. This collection includes tales by David Levien & Brian Koppelman (BILLIONS), S.J. Rozan, Jonathan Santlofer and more. The streets of New York will never look the same. From renowned author William Least Heat-Moon comes a compelling and complex work of fiction, the perfect conversation starter for the holidays. CELESTIAL MECHANICS talks spirituality and love, politics and perspective, weaving a narrative that’s sure to leave you thinking. And if you need an offer for a book you can’t refuse, then read THE GREENFATHER by comic genius John Marshall with an outrageously funny plot that will make you take the book and leave your cares behind. You’ll never read a more hilarious novel. If you want a fresh, weird look at the coming environmental changes to the world, check out DOWNDRIFT, an eco-fiction by noted social scholar Johanna Drucker. You get a 3.8 billion year old species for a narrator, plus a cat’s eye view as a house cat and a lion wander through a world in which animals have started to take on human characteristics. Wild and wonderful—and a little scary. Wish you could manipulate time during the holidays? Check out Robert Silverberg’s brand new collection of time-travel stories, the perfect gift for any sci-fi reader. With tales of incognito universe hopping, a marriage compromised by a time-travelling saboteur, and futuristic lobster overlords, this new book has something for everyone. Grab a copy of TIME AND TIME AGAIN, and presto! Gift shopping done, some free hours for you. “Needle in a Timestack” from this collection is soon to be a major motion picture, directed by John Ridley and starring Orlando Bloom, Leslie Odom Jr., Cynthia Erivo, and Freida Pinto! During the holidays, it’s easy to lose yourself in thinking about everyone else’s needs. Indulge in a self’-centric moment with this compendium of short stories: from beloved science fiction Grand Master Robert Silverberg comes a collection in which every story is written in the first person! Narrators in FIRST-PERSON SINGULARITIES include a lovestruck dolphin, a Greek god transplanted to modern day New York, and a sci-fi writer in search of the meaning of life! Ready for the year to be over already? Gain a new appreciation for your time with THIS WAY TO THE END TIMES, an explosive selection of twenty-one short stories about the apocalypse. Hand-picked by Science Fiction Grand Master Robert Silverberg, THIS WAY TO THE END TIMES includes tales by Jules Verne, James Tiptree Jr., Ursula K. Le Guin, and many other award-winning authors. Bernhard’s poetry may be in the theme of hell, but this new translation from the original German by Peter Waugh is undoubtedly heavenly! Featuring the original poems as well as the English translations, ON EARTH AND IN HELL brings the brilliant and disruptive poetry of Austrian literary sensation Thomas Bernhard to English speakers for the first time. This musical book thrums with urgency and genius—a superb gift choice for poetry lovers everywhere. FULL MOON STAGES is the collection of fifty years of monthly installments from the life of Judith Malina, in which she waxes (and wanes) poetic about her time with the radical political theatre group, The Living Theater, and reflects on milestones of her life’s journey. This exquisite and series of asides from a life full of love, art, and activism spans continents and decades, weaving together an intimate and innovative memoir for the ages. BONUS! for Punk Rock Fans! Keep those holiday spirits up with this infusion of punk energy! Of all the many tomes on punk rock’s glory days, this is one of the best. Author Phil Marcade unleashes a torrent of stories about hanging with the likes of Debbie Harry, Mink DeVille, Bob Marley, and his close pal (and bandmate!) Johnny Thunders in the heyday of the NYC punk scene, with lots of laughs about a world where everyone was broke and just into creating.